Every city has a heart and soul of its own and may claim same rights as a human being. In early 2017 the court in the northern Indian state of Uttarakhand ordered that the Ganges and its main tributary, the Yamuna, be accorded the status of living human entities . The decision, which was welcomed by environmentalists, means that polluting or damaging the rivers will be legally equivalent to harming a person. The judges cited the example of the Whanganui River, revered by the indigenous Māori people, which was declared a living entity with full legal rights by the New Zealand government. The judges said the Ganges and Yamuna rivers and their tributaries would be “legal and living entities having the status of a legal person with all corresponding rights, duties and liabilities”. So, if we are to recognize the entire city to be a living entity, just like a smart human being, a smart city would also require constant monitoring of its health. Just like a human being using a smart band or a smart watch to sense his/her vital parameters such as temperature, blood pressure, glucose, heart rate, lipid profile, Vitamins etc. the smart city may also require several thousand sensors installed in its arteries and touch points to sense its vital organs. Just like a smart band transmitting vital statistics of a human being to a cloud, the measurement of sensors from the smart city touch points also requires to be transmitted to the cloud. Just like the human vital statistics are subjected to triggering health alerts in the event of spotting an anomaly, the smart city sensor data will also have to be subjected to rigorous analysis to observe if an anomaly of ill health to the smart city is spotted in any of its key node and alerts are triggered to the city guardians for immediate treatment. Furthermore, the process of diagnosis, prognosis, treatment and monitoring of human health becomes applicable for a smart city too. This chapter is divided into 4 sections, essential for smart city Practitioners drawn from smart Dubai’s use cases. Part 1 examines the technology and application of Internet of Things (IoT) for establishing a smart environment. 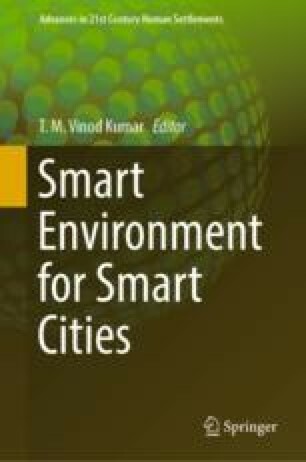 This part will focus on the environmental parameters that can be sensed in a smart city? What kinds of sensors are required? What data do they generate and how do they get transmitted to the cloud? Part 2 delves into IoT Platform where the IoT data is stored, managed and secured along with the survey of IoT platform providers? Part 3 illustrates smart environment use cases of IoT and the parameters that can be sensed in a smart city. Part 4 gives a detailed account of the initiatives taken by Smart Dubai for smart environment management that can be adapted or replicated in other smart cities around the world.